Studies have confirmed an increase in earnings inequality in Japan, but do not agree on how or when it increased, or which groups were most affected. This column decomposes changes in earnings data to show a recent decrease in the returns to general human capital of almost all Japanese workers, at the same time as an increase in the returns to firm-specific human capital among male workers with high wage rates. Gender-based wage inequality has persisted. In many developed countries we are seeing rising wage inequality, a result of skill-biased technical change (SBTC), de-unionisation (Card, 2001, Freeman 1993), a decrease in the real value of minimum wage (Lee, 1999), or globalisation. There has been a lot of research into changes in wage inequality and the factors that have brought about these changes (Card and DiNardo 2002). In the first decade of the 2000s in the US, wages at the bottom and the top of the wage distribution increased faster than those in the middle. In contrast, in the 1970s and 1980s, wages in the bottom of the wage distribution increased by the smallest amount, and those at the top increased by the largest amount (Cahuc and Zylberberg 2014). Card (2001) and Freeman (1993) demonstrated that de-unionisation contributed to an expansion in the variance of the log of wages by about 20% in the 1980s. Lee (1999) argues that the rise in wage inequality among low earners during the 1980s can be attributed to a decrease in the real value of minimum wage. Recently, wage polarisation has been observed in many developed countries, including the US (Autor et al. 2003), the UK (Goos and Manning 2007), Germany (Dustmann et al. 2009), and other European countries (Goos et al. 2009, 2014). In addition to SBTC and globalisation, economic sluggishness has an effect on wage inequality (Lise et al. 2014, Yokoyama 2014, Kodama et al. 2015). According to an analysis by Moriguchi (2010) using a long-term time series of income tax statistics, Japan has been known for its solid middle class and relatively egalitarian society for much of the post-WWII era. But studies have confirmed an increase in income (or household earnings) inequality in Japan (Lise et al. 2014, Tachibanaki 1998, Ohtake 2005, Tachibanaki 2005, Kambayashi et al. 2008, Ohtake 2008, Moriguchi and Saez 2008, Yamada and Kawaguchi 2015). The subjects and data sources vary among the studies, so there is nevertheless controversy about how and when wage inequality has been expanding, and the groups affected. Our research aims to show the extent to which wage inequality among men and women increased in Japan between the 1990s and 2000s, to determine the factors that affected these changes, and to identify the people that were most affected by the changes (Yokoyama et al. 2016). Our data tracked wages during the financial and real estate bubble at the end of 1980s, the Asian currency crisis in 1997, the IT bubble in the early 2000s, and the Global Crisis in 2008. This meant we could observe the effects on wage inequality of the global finance crisis. We employed the Firpo, Fortin, and Lemieux (FFL) decomposition method. This is the first study to use this technical method in the Japanese context on this topic. FFL decomposition combines the DiNardo, Fortin, and Lemieux (DFL) decomposition method proposed by DiNardo et al. (1996) with the Oaxaca-Blinder decomposition method. Using it we could estimate the contribution of each covariate to each of the structure and composition effects when analysing distributional change. This is possible because we used the re-centred influence function (RIF) of Y as the dependent variable. In the first stage of FFL, distributional changes in wages are divided into a distributional change due to changes in β, a structural effect, and in X, a composition effect. In the second stage, these two components are further divided into the contribution of each explanatory variable using RIF regressions. These regressions directly estimate the impact that the explanatory variables have on the statistic of interest. The Great Recession may have changed the structure of the labour market during Japan’s prolonged stagnation during the last 25 years. There are two heterogeneous labour markets in Japan. Although female participation in the labour market has increased and wage inequality has decreased, gender inequality is greater and the gender wage gap is much larger than in other developed countries (Blau et al. 2010). Our shows that after the burst of the economic bubble in the late 1980s, the real hourly wage increased in all quantiles for both genders in the 1990s. This was due to the reduction in the number of working hours brought about by the reduction in labour demand, as well as the implementation of the Act on Temporary Measures concerning the Promotion of Reduced Working Hours (1992) and the amendment to the Labour Standard Laws (1994), which, in principle, set working hours per week at 40 (Kawaguchi et al. 2008, Kambayashi and Kato 2016). In the 2000s, the number of part-time workers increased, even among male workers with low-to-medium wage rates and female workers with medium wage rates. These employees are the Japanese middle class. As a result, their wage rate dropped. This situation is observed in many developed countries (literature reviews in Goldin and Katz 2008, Acemoglu and Autor 2011, 2012 show this). 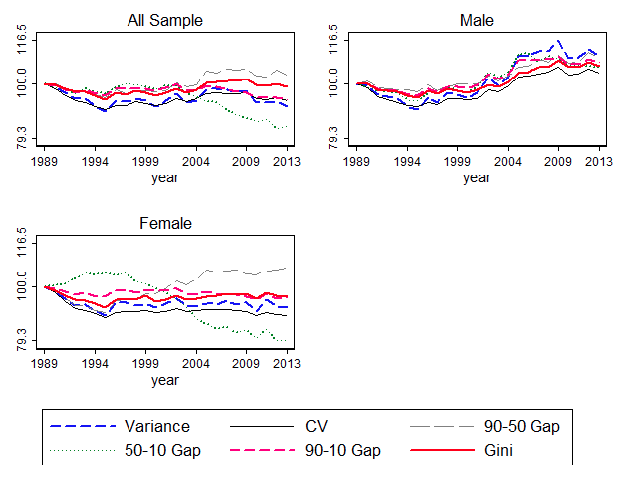 While traditional measures of inequality such as the Gini coefficient, coefficient of variation (CV), and the 90-10 percentile gap do not fully capture the change of the wage distribution, the DFL and FFL decomposition methods in our work also clearly showed the decline of the middle class. The 90-50 gap increased while the 50-10 gap decreased, and so overall inequality for female workers was unchanged. Note: Except for Gini coefficient, ln(Real Wage Rate) is used to calculate each index. Log is not taken for Gini coefficient. The FFL decomposition revealed that a reduction in the returns to potential years of experience contributed to reducing wage rates. This was especially true for male workers for all quantiles, and female workers with a high wage rate. This implies a reduction in the importance of general human capital among these workers. The returns to tenure contributed to decreasing wage rates among male workers with low wage rates and female workers at low-to-medium quantiles, which also implies a decrease in the importance of firm-specific human capital among these workers. These findings are consistent with the ‘stylised fact’ that Japanese firms reduced training costs in the 1990s and 2000s. This suggests that Japanese firms undermined employee involvement and problem-solving activities at the grassroots level, which is considered as one of the key elements of the Japanese employment system. We also found an increase in the returns to tenure among male workers earning high wage rates, contributing to increasing wage rates for this group. This evidence implies that the importance of firm-specific human capital among male workers earning a high wage rate increased, especially during the 2000s. Therefore we are seeing a decrease in the returns to general human capital of almost all workers at the same time as an increase in the returns to firm-specific human capital among male workers with high wage rates. This suggests that Japanese firms invest in a few able workers, regardless of age, because they have been changing human resource strategy in response to change in technology, management environment, and economic globalisation. Acemoglu, D., Autor, D., 2011. “Skills, tasks and technologies: Implications for employment and earnings.” In: Card, D., Ashenfelter, O. (Eds. ), Handbook of Labor Economics. Vol. 4B. Elsevier, San Diego, pp. 1043–1171. Acemoglu, D., Autor, D., 2012. “What does human capital do? A review of Goldin and Katz’s the race between education and technology.” Journal of Economic Literature 50 (2), 426–463. Autor, D. H., Levy, F., Murnane, R. J., 2003. “The skill content of recent technological change: An empirical exploration.” The Quarterly Journal of Economics 118 (4), 1279–1333. Blau, F. D., Ferber, M., Winkler, A., Winkler, A., 2010. The Economics of Women, Men, and Work (6th ed.). Pearson, Prentice Hall. Cahuc, P., Zylberberg, A., 2014. Labor Economics. MIT Press, Cambridge, MA. Card, D., DiNardo, J. E., 2002. “Skill-biased technological change and rising wage inequality: Some problems and puzzles.” Journal of Labor Economics 20 (4), 733–783. DiNardo, J. E., Fortin, N. M., Lemieux, T., 1996. “Labor market institutions and the distribution of wages, 1973-1992: a semiparametric approach.” Econometrica 64 (5), 1001–1044. Dustmann, C., Ludsteck, J., Schonberg, U., 2009. “Revisiting the German wage structure.” The Quarterly Journal of Economics 124 (2), 843–881. Goldin, C. D., Katz, L. F., 2008. The Race Between Education and Technology. The Belknap Press of Harvard University Press, Cambridge, Massachusetts, and London. Freeman, Richard, 1993, "How Much Has De-Unionization Contributed to the Rise in Male Earnings Inequality?" In S. Danziger and P. Gottschalk, eds., Uneven Tides: Rising Inequality in America. New York: Russell Sage Foundation. Goos, M., Manning, A., 2007. “Lousy and lovely jobs: The rising polarization of work in Britain.” The Review of Economics and Statistics 89 (1), 118–133. Goos, M., Manning, A., Salomons, A., 2009. “Job polarization in Europe.” American Economic Review 99 (2), 58–63. Goos, M., Manning, A., Salomons, A., 2014. “Explaining job polarization: Routine-biased technological change and offshoring.” American Economic Review 104 (8), 2509–2526. Kambayashi, R., Kato, T., 2016. “Long-term employment and job security over the last twenty-five years: A comparative study of Japan and the U.S.” Forthcoming in Industrial and Labor Relations Review. Kambayashi, R., Kawaguchi, D., Yokoyama, I., 2008. “Wage distribution in Japan, 1989-2003.” Canadian Journal of Economics 41 (4), 1329–1350. Kodama, N., Inui, T., Kwon, H., 2015. “A decomposition of the decline in Japanese nominal wages in the 1990s and 2000s.” Seoul Journal of Economics 28 (1), 54–84. Lise, J., Sudo, N., Suzuki, M., Yamada, K., Yamada, T., 2014. “Wage, income and consumption inequality in Japan, 1981-2008: From boom to lost decades.” Review of Economic Dynamics 17, 582–612. Moriguchi, C., 2010. “Top wage incomes in japan, 1951-2005.” Journal of the Japanese and International Economies 24 (3), 301–333. Moriguchi, C., Saez, E., 2008. “The evolution of income concentration in japan, 1886-2005: Evidence from income tax statistics.” Review of Economics and Statistics 90 (4), 713–734. Ohtake, F., 2005. Nihon no fubyodo [Inequality in Japan]. In Japanese. Ohtake, F., 2008. “Inequality in Japan.” Asian Economic Policy Review 3 (1), 87–109. Tachibanaki, T., 1998. Nihon no Keizai Kakusa [Economic Inequality in Japan]. Iwanami Shoten, Tokyo, Japan, in Japanese. Tachibanaki, T., 2005. Confronting Income Inequality in Japan. MIT Press, Cambridge, MA. Yamada, K., Kawaguchi, D., 2015. “The changing and unchanged nature of inequality and seniority in Japan.” Journal of Economic Inequality 13 (1), 129–153. Yokoyama, I., 2014. “Why do wages become more rigid during a recession than during a boom?” IZA Journal of Labor Economics 3 (6). Yokoyama, I., N. Kodama and Y. Higuchi, 2016. “What Happened to Wage Inequality in Japan during the Last 25 Years? Evidence from the FFL decomposition method.” RIETI Discussion Paper Series 16-E-081.